In Vivarium, you assume the role of 1 of 8 species seeking to start a new life within a new, unpredictable environment. Initially you are equipped only with your species inherent capabilities and the instincts and fears you brought into the vivarium. By exploring this new environment, accruing Energy and utilizing your abilities you can acquire new behaviors, reproduce, claim territory and complete objectives in order to increase your Fitness. Vivarium is played over 4 years and each year contains 4 distinct seasons for your species to thrive or struggle in, at the end of the 4 years, the player with the most Fitness Points has demonstrated that their species is most suited for survival in this new environment and is declared the winner. 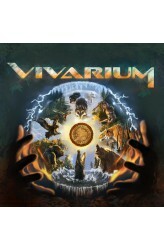 Vivarium is a dynamic game ..